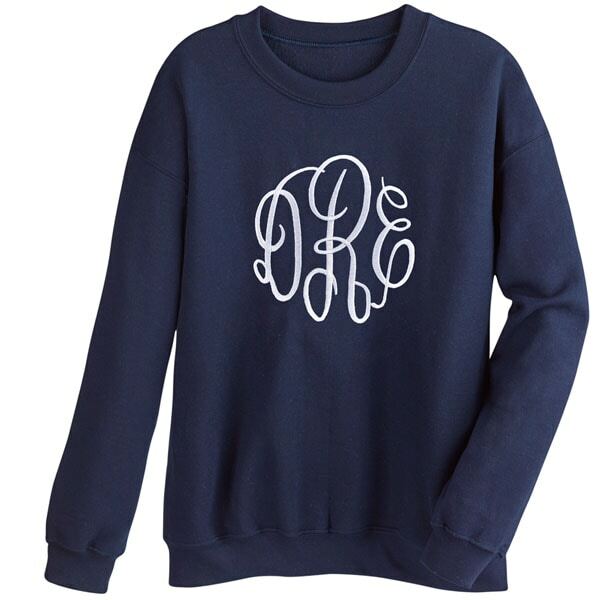 An embroidered monogram adds all kinds of class to a basic (HU1178) or hooded sweatshirt. Hooded version (HU1188) has a drawstring hood and kangaroo pocket. Both 50/50 cotton poly. Machine wash. Imported. Sizes S-2XL. For each, specify Navy or Gray shirt color, Block or Fancy type style, Pink or White thread color, first, middle, and last initial. Please enter your initials in this order: 1) First Name Initial, 2) Middle Name Initial, 3) Last Name Initial. The Last Name Initial will be in the center, in the traditional style.